When children go to a playground, one of the first things that they are likely to do is run to a slide. Playground equipment varies from one location to the next, but there are a few standard and expected fixtures, and it should come as no surprise that a safe and sturdy playground slide is a mainstay for most playground sets. Go to any park or school and you’ll see that kids’ playground slides are the source of hours of fun for many children. Most of them do not even realize the science lessons that they could be learning from their play on the slides because they’re too busy having a good time! If you are setting up or upgrading a public or residential play area with new playground equipment, slides are a must. PlaygroundEquipment.com is the perfect place to find top brands of playground equipment at affordable prices, especially if you are looking for a playground slide for sale that’s perfect for your play space. We have a wide selection of playground equipment, slides included, and just because our prices are low doesn’t mean that we sacrifice quality: Our outdoor slides for sale are commercial-grade products, and each kids’ outdoor slide is crafted to be durable and safe. Playground slides come in many shapes and use a variety of materials. 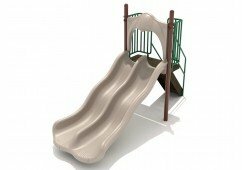 You can buy slides for playground sets that are tunnels or tubes as well as the traditional open shape. 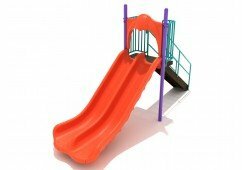 We also offer playground slides for sale that are straight, curved, or spiral. Most of our kids’ playground slides are wide enough for one child to go down at a time, but we also offer larger ones, such as slides with a double chute, which allow kids the opportunity to go down the slide in groups, gaining both physical and social benefits. Tube slides are often made of a sturdy plastic, while straight, curved, and spiral slides may be either plastic or metal. Note that these products have different color options as well, so you can find a color for your play structure slide that matches your surrounding space. We can also help you add custom options to make your slide uniquely yours. Our extensive inventory of commercial playground slides is sure to have something for you! A playground slide for sale can be sold as a stand-alone unit or as part of a whole play structure. When you are ready to purchase a playground slide for your commercial or public space, browse our kids’ outdoor slide selection and sort by size and style to find commercial slides for sale or multi-component play systems that will be the best pick for the children in your community. If you have any questions about our selection of commercial playground slides, feel free to contact one of our representatives at 1-800-667-0097 or reach out online for more information on the product of your choice. We are focused on customer service, and we want to make the entire ordering process simple and easy for you. That’s why we provide free quotes as quickly as one business day. Several shipping options are available, including super-fast shipping of in-stock products. Our team of industry experts is standing by to answer any questions that you have about shipping and delivery of a particular slide or other piece of playground equipment. Contact us today to learn more about your playground slide options!